Whilst, the majority of the “WWE Universe” is awaiting the debut of The Wyatt Family, those of us that watch NXT have been getting a little sneak preview over the last year or so. If this show is anything to go by the rest of the WWE is in for a treat when The Family finally debuts on Raw. This match felt like a great way to kick off NXT. Finally seeing Adrian Neville get his hands on the man who injured his tag team partner Oliver Grey back in February, was an entertaining prospect, helped by the fact that both men are great to watch in the ring. It was disappointing then that only two minutes into the contest it was cut short, after Luke Harper and Eric Rowan pulled Neville down from the top rope, to give Neville a disqualification victory. The newly face Kassius Ohno and Corey Graves made the save for Neville fighting off Harper and Rowan, with Bray Wyatt watching on from the ring. NXT Commissioner and WWE Hall of Famer Dusty Rhodes then got a case of the Teddy Long’s and seeing an equal number of faces and heels around the ring, headed into the arena to create a Six Man Tag Team Match, for the Main Event. I may have been excited to see Neville vs. Wyatt, but this was an equally exciting prospect. Ohno and Graves have had their own problems with the Wyatt Family over the last few weeks and this contest had a similar feel to one of The Shield’s bouts on Raw or Smackdown. The main difference for me between The Shield and The Wyatt Family would be the dynamic of the two different groups. Whilst The Shield has no clear leader and usually attacks as a pack, The Wyatt Family is clearly led by Bray Wyatt, who holds the control over his Family, Harper and Rowan, who tend to do most of the dirty work with Wyatt only ever getting involved when he absolutely has to. It will be interesting to see if the two ever cross paths on the main roster. The match started quick with the face team taking early control of The Wyatt Family, with all three men using a number of innovative moves, including Ohno reversing an Irish Whip by flipping himself over the top rope. We even got to see a little more between Neville and Wyatt early on, with The Man That Gravity Forgot actually getting the better of The Eater of Worlds with a number of reversals. The pace of the match changed as we came back from commercial, with The Wyatt Family working quick tags and keeping Corey Graves in their corner, with some classic tag team action. With Graves eventually getting the hot tag to Ohno, the pace quickened even if Ohno wasn’t in control for very long, after going over the top rope and pushed into the ring apron by Harper. The NXT Women’s Championship Tournament continued this week, with Summer Rae taking on Sasha Banks. This tournament has been interesting so far, with both Paige and Alicia Fox progressing to the Semi-Final stage, and both of the previous two matches have been entertaining contests. NXT probably has a stronger Diva’s roster than the main WWE at the moment, and if a number of these girls were thrown into the mix on Raw or Smackdown, it would certainly help to cement the current push on the Diva’s Division. This was another good bout, Summer Rae’s viciousness throughout the match certainly helps her heel persona and having Sasha Banks fight from underneath for most of the contest certainly got over her as an underdog type of face. There was a nasty looking front leg sweep from Summer which looked like it might have got Summer the victory. With Summer dominating most of the match, it built up well for a Sasha comeback, including some questionable slaps to Summer’s chest, which they might not have gotten away with on Raw! The finish came with some surprisingly good chain wrestling, with some classic cat fighting thrown in for good measure, with Summer picking up the victory with an Inverted Leg Drop Bulldog. I’d expect Summer to get to the final of this tournament, with a Final match between long-time rival Paige, being a mouth-watering prospect. Sami Zayn also appeared this week on NXT in a contest with Angelo Dawkins. It was quite as good as the matches we’ve seen previously out of Zayn, but I think that was more down to Dawkins inexperience than anything else. Zayn picked up a quick victory with a Springboard Tornado DDT. It was after the contest that was the most interesting with Zayn being interviewed by Renee Young. Zayn challenged Cesaro to rubber match in a good promo. Hopefully we get to see this contest sooner rather later, as we’ve seen before from these two it could be an unbelievably good match. Xavier Woods returned to NXT this week. Firstly with a charismatic promo that was a joy to watch, and built his character up well. He went on to have a match with Jake Carter, who I don’t think we’ve seen win a match on NXT yet. He’s the son of Big Van Vader but for some reasons looks like The Miz! It was a good short match between these two, with Xavier looking impressive with a number of signature moves already in place that I can see getting over with the “WWE Universe”. He won the contest with Lost in the Woods, a move similar to Gail Kim’s Eat Defeat. The only issue I have with Woods is the gimmick he has been given, which once again focusses on dancing, I’m not sure what it is with WWE and dancing at the moment but it’s definitely a gimmick that is being over used by the company. Bo Dallas also appeared in a taped segment from inside his car. He talked up winning the NXT Title and going to Disneyland. This was probably the best promo I’ve seen Dallas do, and continued to tease a turn in character which could be good to watch. Dallas keeping his smiling over the top gimmick whilst working as a heel could work very well for both NXT and Dallas, if given the right opponent to work a programme with. There was also appearances from Scott Dawson and Garrett Dylan with manager Sylvester LeFort as they went to Dusty Rhodes to ask for a title shot. There was funny moment with Dusty unable to say Sylvester’s name, as he eventually gave Dawson and Dylan a number one contenders match next week against Kassius Ohno and Corey Graves. I’m still not sold on the partnership Dawson and Dylan have with LeFort, and I think it could do with some extra explanation and maybe some vignettes to help their partnership sit a little more comfortable. A vignette also aired for the return of Leo Kruger. Kruger has had a number of returns since NXT started and for some reason keeps disappearing from television. 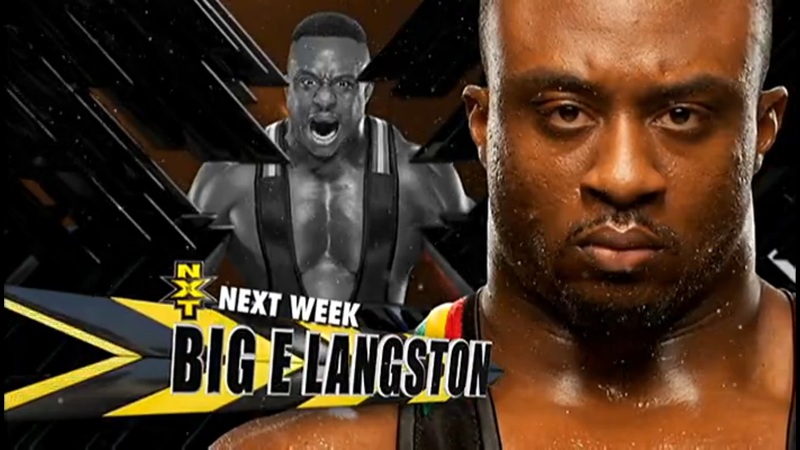 I’m not sure if he’s injury prone or NXT isn’t quite sure how to use him. It was a good moody vignette that attempted to get Kruger over as a vicious loner type character. I’ve enjoyed Kruger on NXT so far and he seems to have potential as a superstar if the right gimmick is found, I look forward to his return. 1. Dusty Rhodes went to the Teddy Long school of General Management. 2. NXT Diva Division is stronger than it's WWE counterpart. 3. NXT isn't the same without William Regal on commentary.